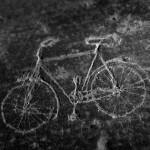 We’ve been recording the abundant pew graffiti in Baile na Cille church – it’s a common phenomenon, evidently. Here are some thoughts on the motivation behind the scratching. Baile na Cille Church is in private ownership now and renovation work will start fairly soon, but with the public opening as part of Doors Open Days we’ve had an opportunity to explore the building in some detail. 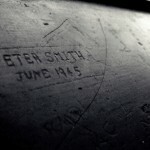 One of the most personal touches is the large variety of names and initials carved on the pews by (mostly) boys. A fine photo of Baile na Cille kirk session. Taken in 1976 at the 25th Anniversary presentation for Rev Angus Macfarlane, Baile na Cille. 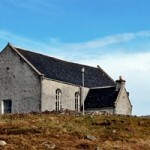 Rev Macfarlane retired in 1979, at which point the congregation merged with that of the Miavaig church. Baile na Cille Church in Uig will be opened to the public for two days in September as part of the 21st Doors Open Days event in Scotland. In 1909 the United Free Church congregation was worshipping in the old leaking Free Church. Work began on a new building in 1913 and they endured a summer of outdoor worship before the new church was opened. The Rev Angus Maciver was the son of Angus Maciver “An Ceistear” (the Catechist), born at Reef in 1799. The family lived at Tobson on Great Bernera from 1835 to 1853. This extract from The Life of a Lewis Catechist, published in the Stornoway Gazette in 1971-2, is Rev Maciver’s memory of meeting-house nights. Colin Ian Maclean (Cailean Ruaraidh Phadraig) was born in 1927 in Crowlista and brought up at 8 Timsgarry. He was minister of the Church of Scotland charge of Trinidad, Port of Spain: Greyfriars and St Ann’s at the time of the laying of this foundation stone for this new building at Arouca. RAF Corporal Technician Pete Davis and his wife Hilary spend the first 18 months of their married life Lewis after he was stationed to RAF Aird Uig. They lived in Linshader and Aird. This is an engaging account of their time in Uig. 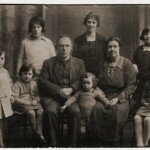 A photo of the Rev Norman Morrison, with his wife, sister (behind him) and children. 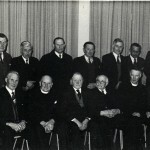 Rev Morrison was minister at Baile na Cille from 1931 to 1950. He wasn’t the first of that name in Uig; the third known minister in Uig was also Norman Morrison, 1742 to 1777, who was a grandson of John Morrison, tacksman at Bragar – known in the archives as Indweller.